People often like to describe bitcoin as digital gold, but that analogy isn’t a very good one. Bitcoin is categorically different from the yellow metal. If we had to choose a metal as an analogy for bitcoin, that metal would be boring grey in colour (and thus lacking ornamental purpose), useless for industrial purposes, but scarce. As far as I know no such material exists, so let’s come up with a name for this imaginary metal: uselesstainium. Bitcoin is digital uselesstainium. Let’s dig more into the difference between gold and this stuff we call uselesstainium. There are two reasons to value something: 1) because you want to use it, or 2) because you expect to pass it off in the future. Pass-it-off demand may be for short-term purposes, like money—you only expect to have a dollar bill in your wallet for a day or two before spending it on. Or it may be for the long-term, like a speculative asset that you intend to keep for a few years before selling to someone else. Either way, pass-it-off demand means that the item’s value to you depends on what *the next person* is willing to provide, not on its use-value. The demand for gold is made up of both types of demand. A portion of those active in the gold market value it as jewellery or a collectors item, or because it can be used to make circuitry or in satellites. The other portion likes the metal for its pass-it-off purposes, say they expect that someone else will pay twice the price next year. Because it is an ugly grey colour and thus unsuitable for collectors or jewellery wearers, and it can’t be used in teeth nor for industrial purposes, uselesstainium has no use-value. If it is going to be valued at all, then pass-it-off demand will have to be wholly responsible for generating that value. Thanks to this difference, the prices of gold and uselesstainium will act very differently. Let’s say the two metals are each trading at $1000/oz. Each of them suddenly suffers from a freak $100 drop in price. No event has occurred to cause it, nor have people’s tastes change, nor has the technological backdrop been altered. It’s a fat finger event. In this context there is *no* fundamental reason for uselesstainium to return to $1000. With gold, however, strong market forces will emerge to help fix the mistake and push the price up towards $1000. Gold is a good conductor of electricity. And unlike copper and other metals it doesn’t corrode, which means that gold electrical connections are superior to most. However, an ounce of gold is much more expensive than an ounce of copper or any other metal. When gold was at $1000, manufacturers of printed circuit boards (PCB) will have made a tradeoff between gold and other materials subject to the preferences of their customers, choosing the optimal amount of gold for the parts of the board that are too delicate to suffer from corrosion while directing copper, silver, and other materials to the rest. But with gold now at $900, the yellow metal has become marginally more competitive than other metals. At these prices, PCB customers can afford to ask for a bit more gold on their boards. This demand will help drive gold back up to $1000. The PCB market won’t be the only market to demand more gold. Collectors, jewellers, dentists, and many others will all find gold a little more advantageous than before relative to alternative materials and will step up their buying. Their combined purchases will help counterbalance the mistaken fat finger trade. Speculators who are attracted to gold solely for its pass-it-off value will contribute to this rebound. Because they are constantly trying to anticipate the needs of future buyers, including those in the PCB market, speculators will purchase as much gold as they can from the fat finger trader based on their informed opinion that they can resell it to board manufacturers at a higher price. When uselesstainium falls to $900, no equivalent forces exist to drive the metal’s price back to $1000. Remember, because uselesstainium has no industrial value the only basis for valuing it is by trying to guess what price it can be passed off to others. Whereas a gold speculator can try to anticipate the needs of participants in the PCB market, a uselesstainium speculator can only sell to other speculators. This means that she must try to anticipate what other speculators are likely to pay, while at the same time these potential buyers are in turn trying to anticipate what she will pay. Confronted with a sudden $100 crash, there is no inherent reason for a uselesstainium trader to anticipate that average opinion anticipates average opinion to move the price back up to $1000. A move up to $1100, or down to $700, or a collapse to $0, are all just as likely. In a beauty contest, there is no right or wrong price for uselesstainium. Since there is no use-value to anchor uselesstainium’s price, we’d expect it to be far more volatile than gold. Likewise with bitcoin, which is both rare and demanded solely for pass-it-off purposes. Let’s take a look at a chart of the relative volatility of bitcoin and gold to see what it shows. What you see in the above chart is the median daily change for each asset plotted over a moving 200-day period. By using the median rather than the average I am stripping out some of the large gut-wrenching changes that assets experience, in an effort to give a sense of what happens on a day-to-day basis. Gold’s median change since 2011 (the black dashed line) is around 0.5%. This means that on a majority of days you should expect a gain or loss of around 0.5% if you hold the yellow metal. Over the same time range, bitcoin’s median change (the dashed red line) is about 1.7%, which means that an owner of bitcoin must generally deal with moves of +/-1.7% each day, more than three times what a gold owner must bear. 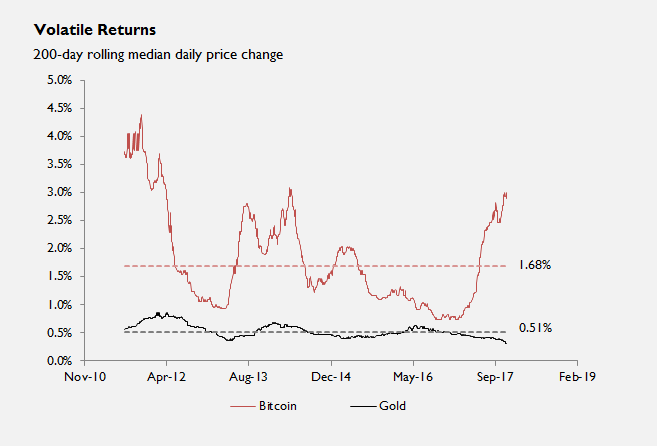 Bitcoin’s rolling 200-day median return (the solid red line) is much less stable than gold’s. It almost fell to the same level as gold in late 2016, hitting a low of around 0.75%, but has quickly moved back above 3%, a level last seen in 2011 and again in 2013-14. The volatility gap between gold and bitcoin—the distance between the two solid lines—is currently at its widest since 2012. Bitcoin will always be an incredibly volatile asset because it exists entirely on pass-through demand. Like uselesstainium, it is a pure Keynesian beauty contest. If all contestants in the bitcoin price-setting game come to believe that the average contestant believes that the average contestant believes bitcoin is worth $0, then that belief will self-realize itself and bitcoin will fall to $0. If they all become 100% sure that it should be worth $100,000, then it will jump to $100,000. These sorts of price implosions and explosions can’t happen with gold because its usefulness inspires economic behaviour that counterbalances beauty contest dynamics. Now it is possible that bitcoin inherits some useful properties and therefore shifts from being a form of digital uselesstainium to a form of digital gold. Bitcoin advocates will often mention time-stamping as a service. People can take a digital representation, or hash, of a document and put it on the bitcoin blockchain by spending a small amount of bitcoin. Once accomplished the owner of the document will be able to publicly prove that they were the owner of that document on that date. Bitcoin time-stamping would in theory compete with other alternatives, like real-life notaries or the post office. In the event of a bitcoin price crash, anyone who wants to get cheap time stamping services may step in as buyers of bitcoin, in the same way that PCB makers support the gold market. However, time stamping is still in its infancy. Certainly other uses for bitcoin apart from time stamping may eventually be found, but until then bitcoin remains digital uselesstainium, not digital gold. Plenty of money can be made betting on uselesstainium, and much can be lost. But no one should be buying uselesstainum—whether it be the digital type or physical—unless they are comfortable playing in a pure Keynesian beauty contest. This blog post is the second in a series of guest posts on BullionStar’s Blog by the renowned blogger JP Koning who will be writing about monetary economics, central banking and gold .